We've got our fair share of polls at the beginning of this campaign. 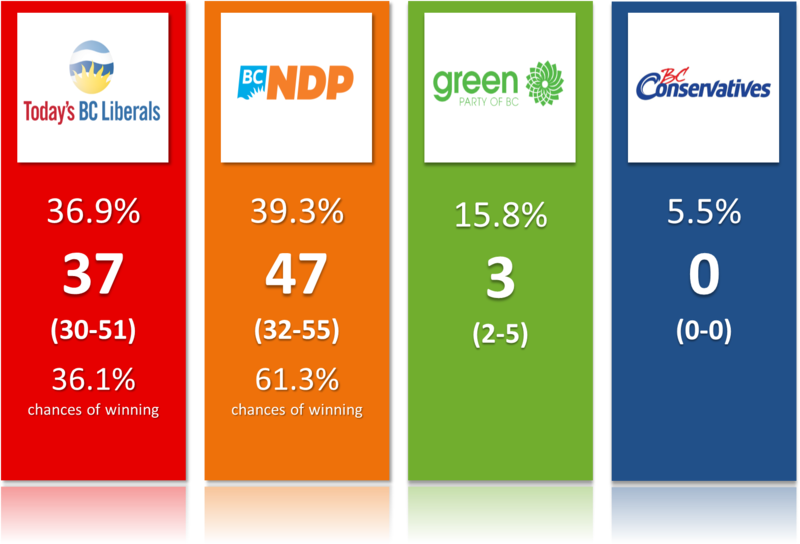 They all show the NDP ahead (some by a small margin, others by a larger one) but they also almost all have a large number of undecided. On top of that, IVR (automatic phone calls) polls seem to have the BC Conservative much higher than online polls. Based on the latest polls, here are the most recent projections. More details on the BC Election page. Voting intentions; Seat projections with confidence intervals; Chances of winning the most seats. We of course all remember the polls in 2013. 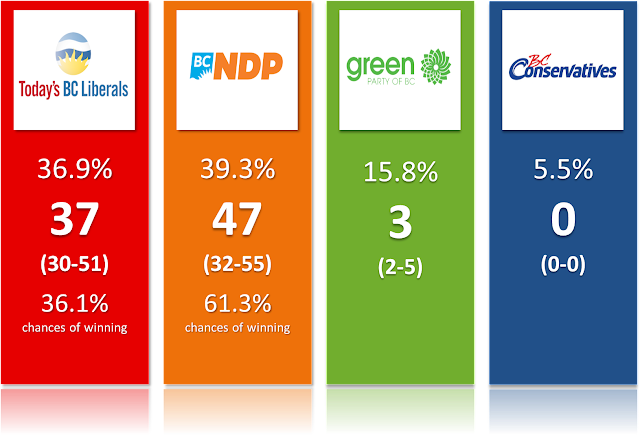 They were all predicting a BC NDP victory but they ended up dead wrong (this remains one of the biggest failures of the polls in Canadian history). So maybe, just maybe we should look at different indicator in order to predict the race. One possible tool is online presence. Using Google Trend, Maclean's journalist Jason Kirby pretty much nailed the federal election in 2015. There are other evidence that this can indeed work, especially for party leaders. I thus tried to use Google Trend and limited the results to the last 7 days in British Columbia. When searching for the leaders, I had to use "search terms" instead of the topic option because the latter wasn't working for John Horgan. As you can see, Christy Clark is way ahead here. This confirms that she is by far the most known of the three party leaders. But being known isn't always a good thing, it also likely means more people dislike you. 2. Google searches for the main two parties (not possible to do a topic search for the Green party, only a term search, so I dropped the Green for this graph). So right now, it seems the answer depends a lot on the exact variation we are using. In scientific terms, the results are far from being robust. What they do show is that John Horgan is not well known at all and he didn't catch up to Clark in the last 7 days. If we focus on the main two parties and use the topic search option, we get a close race with the NDP slightly ahead, exactly like the polls. This might be the best tool moving forward. I'll keep using this method throughout the campaign, just as an added tool. If anything, this is interesting.